All great designs come from deep understanding to customers. In my case, I'd like to design the email service for information workers(IW) as I am one of them. Basically they are hired to get things done. Modern projects, or tasks in smaller granularity, are getting too complex to be accomplished individually. So people have to work together – we call it collaboration. Consequently they have to communicate. They are forced to communicate. Email solves the problem of logistics and synchronization so that communication could happen between different time frames and locations, so it is still indispensable currently. But it is far from perfect, sometimes it is a trouble. Can it be done any better? Let us have a try. This new thing is called Pmail. First of all, let us keep in mind that tasks are actually what IWs really care about. They are much happier if they can complete assigned task without touching emails. Right? Completion of tasks is what they are trying to achieve. Second, when they have to communicate, they care about distilled information they are expecting while writing/reading emails. You will not get any additional credit through presenting your idea by writing a poem. Senders and recipients come last. Without them, communication can't happen. These two entities get lower priorities because if distilled information can be gained by other means, say search engine or anonymous DL, who cares them? Again - email for IWs is all about tasks, not messages. This is the most fundamental philosophy differentiating Pmail's design from others. Email overload. You might probably find everyone around you is complaining about too many emails. Doubt? Open you email clients, see how many unread mails you have. NY Times reports, E-MAIL has become the bane of some people's professional lives. This occurs likely because of complicated job nature, but I'd say often it is actually because of poor email prioritization. Can you easily tell which email is much more important than others? Or emails tell its priority to you? Hard to map emails to one's day-to-day jobs. How many times you have to search your emails to dig certain messages out because you need something? Mail thread discussions often go wild. Do you find you are in trouble figuring out what is going on when suddenly looped in a thread? Pmail's primary design goal is to help team get jobs done efficiently – under right timing, priorities, order and resources. Everyone would have a clear picture about how his work contributes to team success. Know big picture for better prioritization – Steven, who is a developer in a software development team, came to his office in a morning. He opens bird view of pmail to check how his tasks (or WBS in more general term) fits into the entire team progress. He notices one of his tasks, task8, is in critical path according to updated plan(never expect plan is really locked after lock-down). This task is automatically prioritized to p0(highest priority) by Pmail. It is about implementing a feature according to design specification by feature PM. 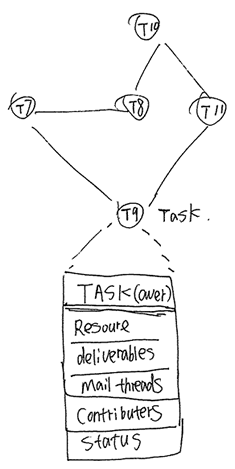 Maintain dependencies – Steven goes ahead to open task8 and find this task depends on two resources, 1) one LHS virtual machine, which has been completed by task7. VM address and credential are also attached. Nice! 2) PM spec. It is also claimed completed. Main email threads around tasks –Steven opened the spec document in team Sharepoint server, and he finds several points are not clear for him. Then Steven starts a mail conversation with relative PM, Joanne, against this task. The mail thread is linked to task8 and its status is open. Drive team work flow – Joanne received a catch-the-ball mail from Steven about p0 task8, so it is a shadow p0 task for her as well. Joanne can check task details in the Pmail. She quickly comes up with answers regarding Steven's questions and writes back a here-you-go email to Steven. Steven receives the email and get unblocked. Steven closed the email thread by several sentences. This mail thread is traceable in task8 and can't be replied any more as it is closed. Several hours later, Steven completes task8 and closes it in Pmail. When Steven re-visits the bird view page of Pmail, he finds task8's color turns green due to status change. Steven then picks up another one unblocked taks, task9. Maintain team discussion – Task9 is about designing a new feature F9. Deliverable is reviewable dev design spec. Steven has two options about solving a technical problem, but not sure which way to go. He then sends a collective-effort discussion mail to the whole team. Since this is not a catch-the-ball mail, team mates will treat it with best efforts, but Steven still gets several great feedbacks. When he feels the problem is solved, he summarizes the thread with several sentences and closes the thread. Check history – One year later, Steven transfers to another team and his replacement, Eric, would like to better understand why F9 is designed this way. 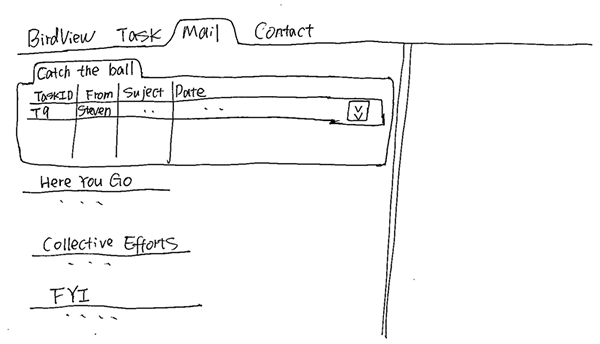 He opened Task9 in Pmail, check the mail thread and better understand original design decision. Bird view will look like above diagram. In following task view, you can see all mail threads about one task are at your finger tips. Mail view will also a bit different. Every mail has a TaskID field to help you get the whole context conveniently. In addition to biggest differences we covered before, you might also get excited when seeing below features. Sometimes feature-rich is not a good thing. It is so easy to reach this point when email system is designed for multiple purposes after several releases, say home usage included. But in any event, Pmail will provide a button to show/hide features(say, increase/decrease indent) which I don't use in last month. Get me a simple world. Automatically memorize folder or url of files you are editing, and go to Pmail, it can be attached to the email by a hot key, say "ctrl+shift+v"
Mail web client also provides web API like Facebook. OWA kills programmability. Tag everywhere – one mail thread might relate to more than one task. It is not a good idea to put a mail in one folder exclusively. I am interested in your thoughs on it. Let me know. Thank you.